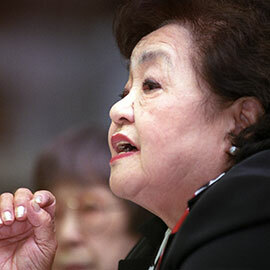 Brantford – Wilfrid Laurier University will host a series of lectures with Hiroshima survivor and peace activist Setsuko Thurlow titled, “Confronting the Nuclear Age: A Hiroshima Survivor Remembers” on Feb. 28 and March 1 at Laurier’s Brantford campus. As part of the People Make History lecture series, Thurlow will share her experiences growing up in Japan during the Second World War, surviving the atomic explosion over Hiroshima, and her work as an anti-nuclear weapons peace activist. Thurlow was born in Hiroshima, Japan. At age thirteen, she was present during the explosion of first atomic bomb over the city of Hiroshima on Aug. 6, 1945. After the war, she studied social work in Japan, the United States and Canada. She moved to Toronto in 1962, with her husband and two sons, where she worked for decades as a social worker. Thurlow shares her story as a Hiroshima survivor and has initiated many anti-nuclear activities to bring awareness about nuclear issues in the past and present. In 2016, she was awarded the Arms Control Person of the Year Award from the International Campaign to Abolish Nuclear Weapons. She is an advisory council member of the Nuclear Age Peace Foundation. Feb. 28, 1 p.m. – 2:20 p.m., room 205 in the Odeon Building, 50 Market St.
Feb. 28, 7 p.m. – 8:30 p.m., room 203 in the Research and Academic Centre, 150 Dalhousie St.
March 1, 2:30 p.m. – 3:50 p.m., room 110 in the Odeon Building, 50 Market St. The lecture is presented by Laurier’s History program in Brantford and supported by the Estate of Mary B. Stedman. The lecture is free and open to the public, but seating is limited. Please reserve your seat by contacting Nicole Morgan at nmorgan@wlu.ca or 519-756-8228 ext. 5537. High school and university students who attend any of the events are invited to enter an art contest inspired by the event and could win a smart phone. More details about the contest will be provided at each of the events.